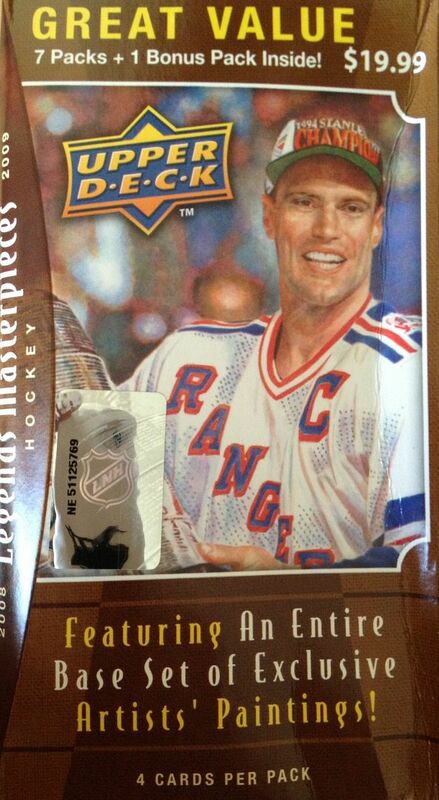 You know you're going to get some of the most legendary names in hockey when you buy a box of Legends Masterpieces. The name of the product basically tells you what you're going to find. 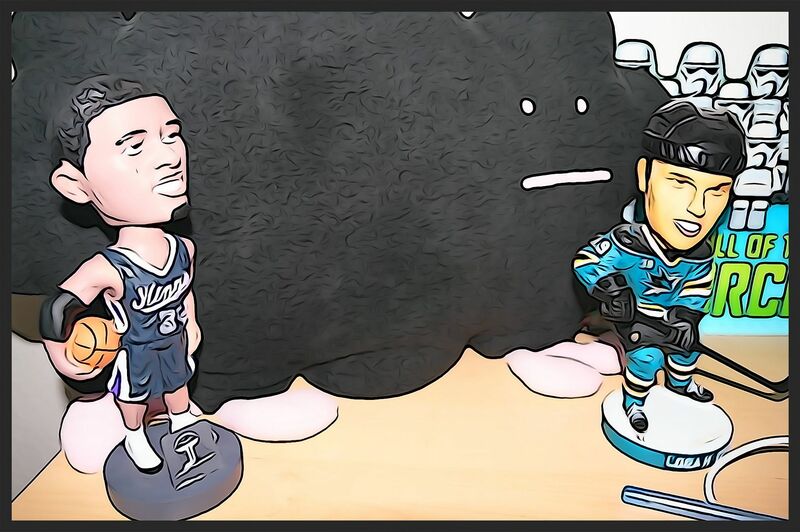 This product has artistic renditions of the very best from the NHL's storied past. 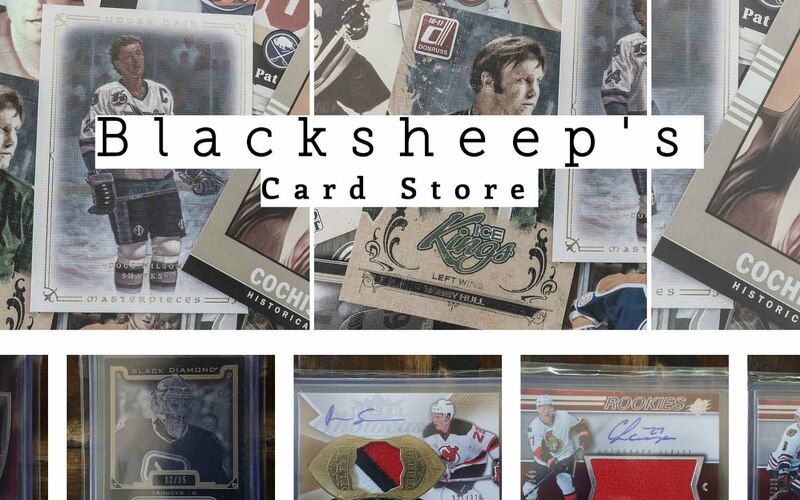 The cards are beautiful and can be enjoyed by just about anybody who likes hockey. Legends Masterpieces is a product that stands out to me because it's something Upper Deck just had for one release season... and it made it to retail store shelves! Common products like Upper Deck Series One & Two as well as Artifacts, Black Diamond, and MVP can always be found. Masterpieces is definitely a different sort of card set, some I'm drawn to it whenever I get the chance to purchase some. I'd love Upper Deck to offer more one-off sets like these as it shows creativity in the hobby. 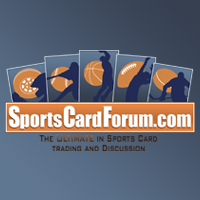 Some collectors have complained that without another card company pushing Upper Deck, the cards can get repetitive and stale. Well, if UD can produce more like this, I think collectors' minds can be at ease when it comes to that issue. Like the last few times of opening Legends Masterpieces, I didn't get a hit. This blaster had all base cards save for one brown bordered parallel. Usually that would be pretty upsetting, but with the quality of these cards and the great names coming out, I don't feel as bad. It's hard to get too sad when you're pulling multiple Gretzkys and other huge NHL names from a blaster box. I mentioned quality... and I want to bring it up again. These cards are really great, especially at this price point. Each card has a canvas texture that feels really nice. The artwork is superb. This set oozes with quality. It's just a guess, but soon after this set came out Upper Deck started doing canvas cards in their main UD1 and 2 sets. Perhaps this was the inspiration for those cards. I think it's pretty awesome that Upper Deck put 'Mr. Hockey' on this card. What a great looking image of Gordie Howe with a couple of very coveted trophies around him. 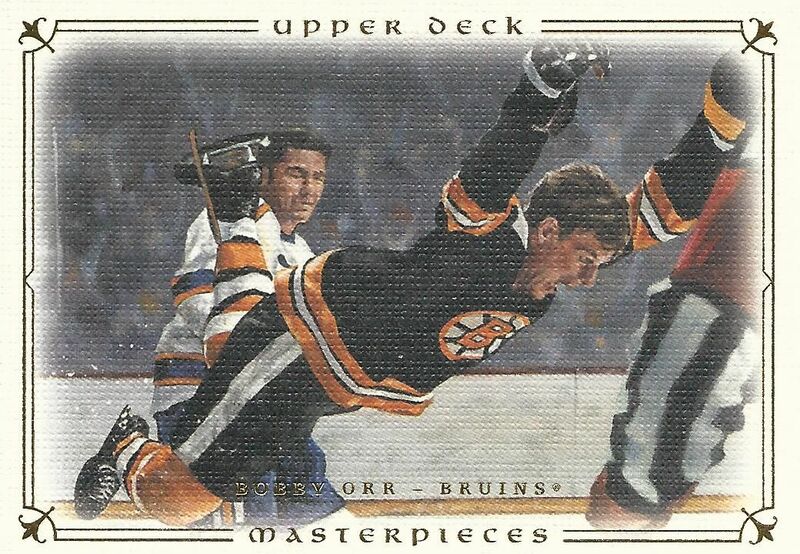 This card captures one of the most iconic moments ever in the NHL. 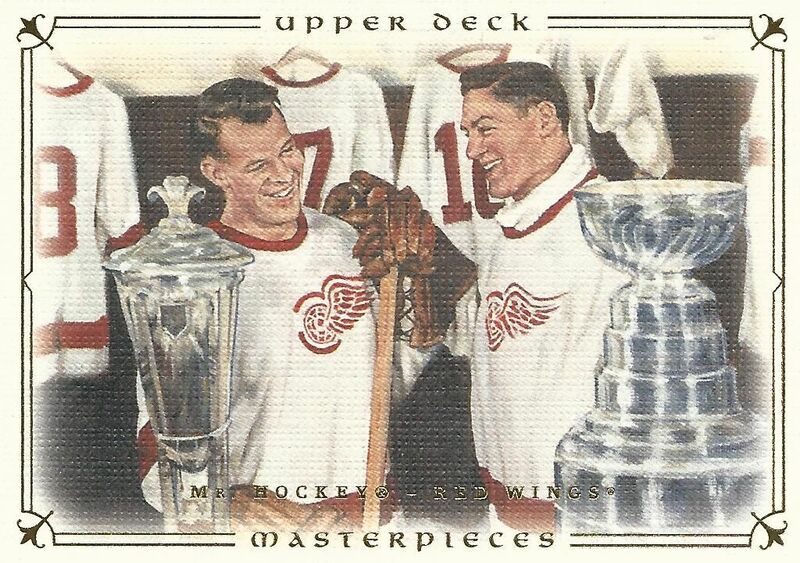 The image on the front of this card is a replication of a photograph that captured Orr after scoring a goal. 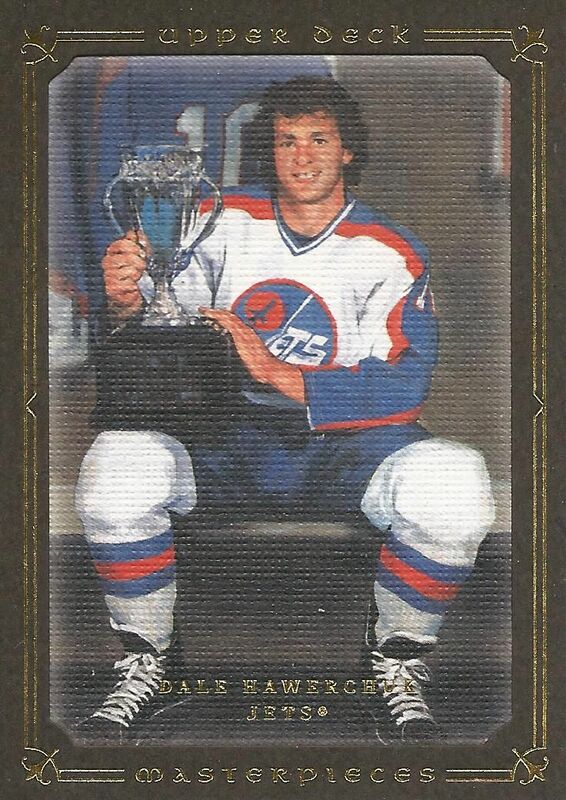 My only insert in the blaster was of Hawerchuk sitting in his locker with the Calder trophy. It would have been better to get a hit, but I can live with this card for sure. I think I'll always enjoy breaking UD Legends Masterpieces. It's just so much fun to see the amazing history of the NHL put on canvas. The product is pretty affordable. The only thing I'm afraid of is that it might run dry sooner than later. Hopefully I'll be able to get a few more blasters of this stuff before it is gone forever! AWESOME VID, I love it every time you bring this blaster back! I am not a set builder, but these cards really captured my attention and I bought multiple blasters to build the entire set.